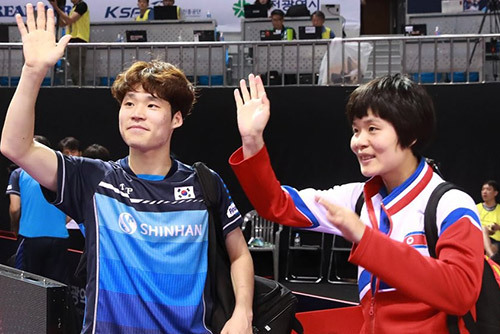 A unified Korean mixed doubles team reached the semifinals of an international table tennis tournament in South Korea on Thursday. The duo of Jang Woo-jin and Cha Hyo-sim defeated Ho Kwan Kit and Lee Ho Ching of Hong Kong 3-0 in the quarterfinals of the International Table Tennis Federation World Tour Platinum Shinhan Korea Open in Daejeon. Jang and Cha will face Chen Chien-An and Cheng I-Ching of Taiwan in the semifinals on Friday. Earlier Thursday, the other inter-Korean mixed doubles pair of Choe Il and Yoo Eun-chong lost in the round of 16 to the South Korean team of Lee Sang-su and Jeon Ji-hee. In the men's doubles, the joint Korean team of Lee Sang-su and Pak Sin-hyok have secured a spot in the quarterfinals, but in the women's doubles, the South’s Suh Hyo-won and the North’s Kim Song-i were eliminated in the round of 16.